A Walk among God's or demons, Falling neither between light or dark, A gradual decline for the darker arts, A connection that should not be made. Not meant to be, yet it's come to be, A touch of darkness a bit of light, to make things all right. - easy and effective resource management for caster and allies. - Supports Range allies better then melee allies. - Defensive support that relies on allies positioning or timing of synerizes. After several tests and quite a long time at white board this most balanced and effective results. Goes a bit below standard 35k magicka, but the effect is no less, but greater not just in numbers, but overall balance. By mixing divines and infused the issue of when pet dying and drop of health is resloved by having min health at 17k instead of 16k as before seen in previous build. A bit of mixing glyphs has resulted in 2k regain instead of 1.8k regain. This mostly to allow for more mistakes and better sustain. A person can simply remove 1 magicka regain glyph and put a spell damage glyph instead for more effective heals. You can also mix and match food and glyphs as purple glyphs and food is cheap. So their is room to shape the healer build into your own. This race is prefect for hybrid healers. 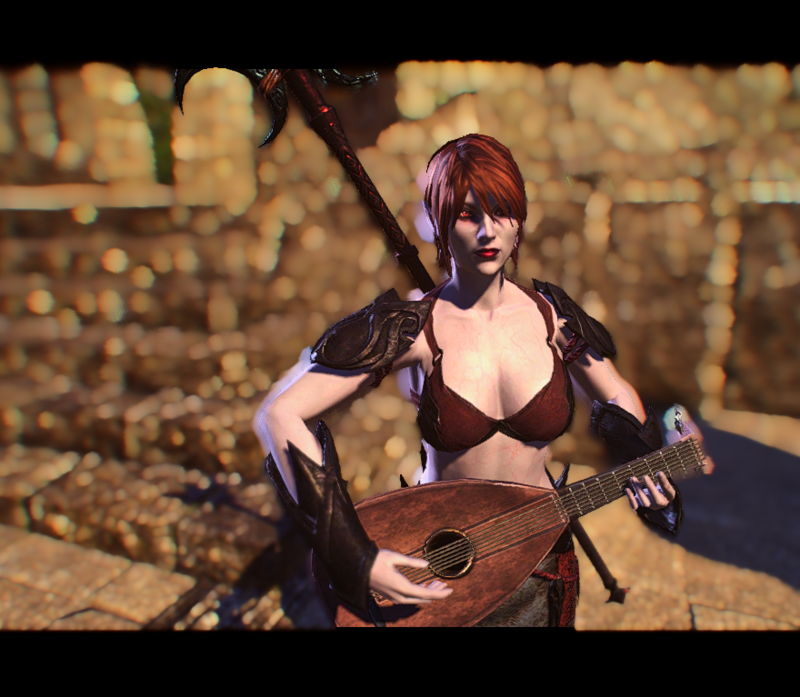 For it has the ability to support allies with stamina support skills and magicka support skills. In addition, with sorc class skill "dark exchange" it allows a smooth interchange between stamina and magicka. Along with this there is useful support for the healer themselves which is resistances to disease and poison damage. This it the better choice compared to say 1k more healing. Also there is no issues blockcasting, sprinting, or breaking free because of the greater abundance of stamina. All the light amour passives are necessary for their effects of reducing cost,adds spell critical, magicka regain, spell resistances, and spell penetration. While on the other hand, some heavy amour passives are important to obtain. Just 1 piece gives 2% more max health that pushes us over just 18k. Also provides a slight increase of resistances. Lastly the constitution passive from heavy amour will increase sustain by giving stamina and magicka back when hit. Going well with absorb, a passive from restro staff line, that restores magicka when you block a spell. 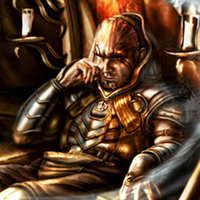 All attributes points should be placed in magicka. This important to reach base line max magicka for healers between 30k and 40k max magicka. 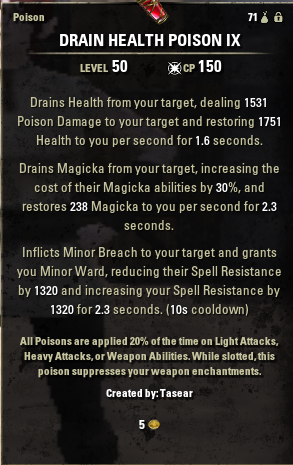 In general though more magicka means heals will be stronger. Any health requirements can be made up by undaunted passive and and Sorcerer Expert Summon passive, increases health by 8%. As such even with a different race this is optimal decision for sorcerer healers. Though with changes with the build more races can be effective. So use your favorite race. On point, after testing sorcerer class doesn't need apprentice or atronach as other four classes because of it's passives, but it's greatest weakness of lack of innate access to direct healing passives and heals over time make the ritual best choice. The ritual will increase skills use as blood atlas (minor life steal) and healing orbs. Thus making ritual a wise choice. For overall balance Witchmother potent brew was best choice. It allowed for health about of magicka, magicka regain and in consequence health and stamina. But below is different options presented from @troomar. Moon sugar is best... but have drinking so many potions... the more tradition flavors seems appropriate here. First Essence of spell power for the appropriate level. 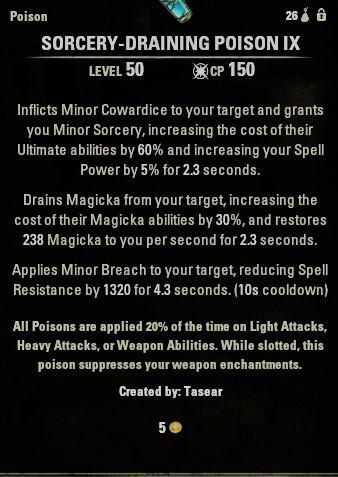 I will provide magicka, spell critical (higher heals % damage), and spell damage which effects things such as healing springs, mutagen, and orbs. Next is Essence of Immovability which isn't a common potion you hear healers care, but there's a good reasons you should use it. First it will provide a chance to rez allies in chaotic situations where boss (vCOS), mobs, or even environment (tempest) will be against you. It's also good to use when off tanking in fang lair or dragon star arena (final boss), A slight benefit to use on stone atronach in vAA so you won't get knocked back. While not as amazing as the other two. 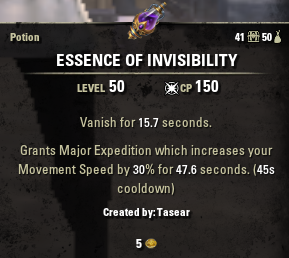 Would like to mention essence of invisibility. Doesn't work in newest dungeons, but will help by pass by unnecessary and dangerous mobs while doing speed runs. Now that's it's become common practice for tanks to use crushing and weakening glyphs, it has lead to more options ... even beyond simple enchants. First we have 2 poisons set to forgo potential weakness the class make face. We have breaching poison to add a bit more to dps for a moment and potential defile bosses such final boss in direfrost (who heals itself). 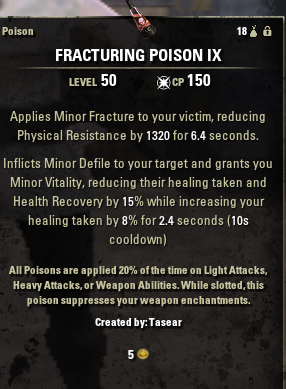 We have a matching fracturing poison to do the same when with more stamina dps. Both of these complement a tank using crushing. Now assuming those are unnecessary, there a few more options. 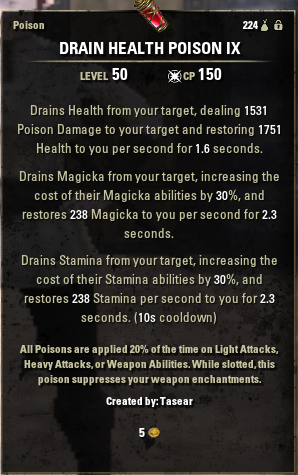 I have one sustain poison that helps with magicka and stamina while doing some damage, while other is another from of breaching poison, but with sustain addition. These have proven to make battles more comfortable. 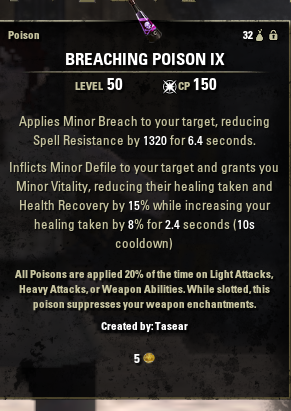 Now lastly is what I call tastiest poison that buffs yourself with %5 more spell damage (stronger heals), gives slight about of magicka back (better endurance), and applies minor breech. This is useful in end game fights ... especially with magicka dps. After advisement, and a lot of testing. This best results of end game assortment for champion Sorc healer. The allocation Warrior (red) champion points is balance for prefect defense of the user, during the times they take a hit It also keeps in mind vampism. By reducing damage over time and elemental effects, this lessens the effect of burning and direct fire damage. Able to survive with stage 3 vampire in most places. Also undead passive from vampire reduces damage taken by 50% as long not a one shot. This goes well with Sorcs who have passive for extra health and can shield quickly during dangerous moments. Some notable achievements with this build is not being one shotted in veteran fungal grotto from boss that chains and brings a sword of death on you. Also, doesn't get one shot by Asylum dragon jump.. though run fast if sides cause two will kill you. The interesting passives are mostly from lady for Warrior. These help with sustain of magicka and stamina so they the focus first. Added with Dragon bones is phase passive to give extra resistances after dodge rolling. A nice feature for bosmer healer and works well with tactician passive in blue tree that sets enemies off balanced. In regards to Mage (blue) Champion Points, I took in consideration for first time ever there's enough champion points for two 120 passives. So I moved some champion points from raw healing and critical damage into Atronach Constellation. The important stars here were staff expert (increases off heals from resto staff) and and master of arms (increases damage from pet) this more idea this more popular choices of putting points into Thaumaturge for Sorc healers, because takes in consideration of pet and extra off heals it might need. On point the passives in Atronach are quite healer worthy. It mostly adds extra passive damage through light and heavy attacks along with blocking. Also, most important passive reward is tactician that gives even more up time to off balance when avoiding attacks by dodge rolling. This of course is another plus to bosmer choice with extra stamina and stamina regain. Now talking about Thief (green) Champion points, there's not much difference in most places then others, but in some it's major. 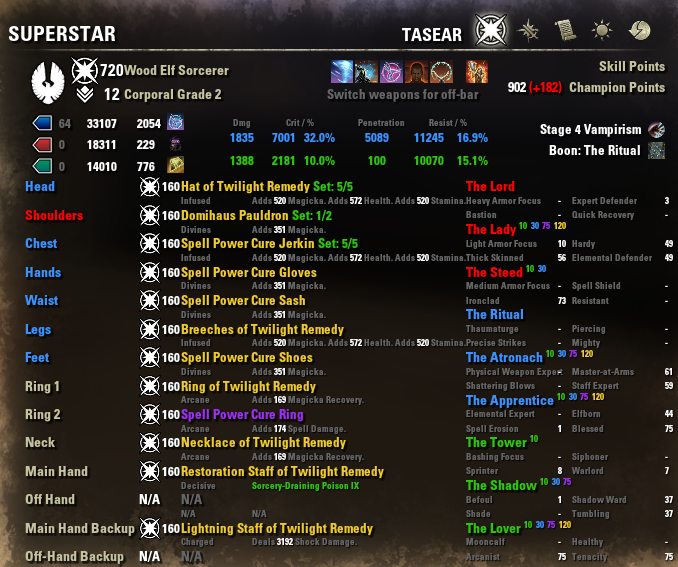 Tenacity, Arcanist, both get 75 points as bosmer race leaves little choice in this regards to getting enough magicka regain. Only a little points were added to Warlord and sprinter to reduce stamina costs in sprinting and breaking free as base stamina 14k for this build. Added points into tumbling and shadow ward for better evasion of damage and damage cost. I own over 240 items for support and nearly compete sets for all. As such I taken a huge consider for this and I find twlight remedy still provides most offensive results for Sorc healer. While does relay on proc of synergy it does increase minor force uptime and provide lack of heal over time (that's not an ultimate) for Sorc Healer. On hand I can off handily, recommend Guidance for Veteran Trials, and as a different and easier option than twilight Remedy. Using guidance, allows for higher uptime of buffs that may be lost in bar swaps. It's also a good offensive and defensive set that won't vary in effect depending on team make up. Take note that I added 1 piece heavy for extra health and resistances, along tiny bit extra sustain. I picked domihaus for extra stamina and magicka, but can switched out for other items as needed. The other set is spell power cure set that increases damage. This a standard set for all healing classes. Though in future would like test the effectiveness of Twilight Remedy and Guidance together. Mind you though some skills don't work with guidance (any location passed skills) so take time to test and see results. In regards to other options, I check my other build Synergizer(Pug Proof) that gives more detailed account on gear choices for Sorc Healers. It's a good read as takes in a account of how gear effects the class not just the group. - This useful protection of caster and pet along with giving support to nearby allies with 10% regain for 10 secs. Also, I would flex this skill with ward ally for squishy tanks or allies. - Useful in providing healing over time in a sustainable matter. Take note that this skill can stack on it's self so good skill to use when everyone is all close up and tight or target at a distant to effect allies in larger arenas beyond the scope of other healing skills. This Healing Skill is affected by spell damage, maximum magicka, or healing increase bonus from gear, champion points, or mundus. - The most adaptive burst heal for chaotic situations. It's high burst heal two allies or yourself ( unlikely need with shield up). 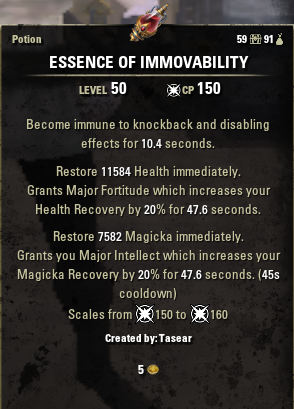 This Healing skill is affected by mainly maximum Magicka, but can also be increased from healing increase bonus from gear, champion points, or mundus. -The most basic healer support skill for adding resistances, buffing allies and healing. Use this as an instance heal and buff to reapplied ideally every 8 secs. I would definitely use before (so they take less damage) and after incoming damage (escape they don't dodge). This Healing Skill is affected by spell damage, maximum magicka, or healing increase bonus from gear, champion points, or mundus. -This is extra heal over time in skill section that is used mostly for uptime of spell power cure. Though, it's useful in large areas or places with a lot of movement or distance from allies. It also has a burst or instant heal attached to it if ally drops below 20%. Doesn't happen often but when it does., it's cheap heal that didn't require your attention. Now, one other thing it does is provide purge that removes 1 harmful effect. During Trials, I would swap this out for a different skill such a mage light, or purge. 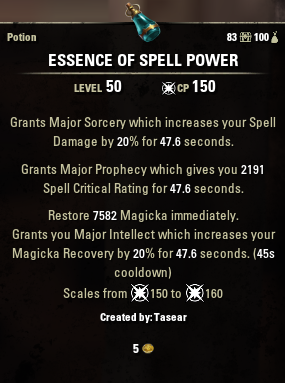 This Healing Skill is affected by spell damage significantly, somewhat maximum magicka, along with healing increase bonus from gear, champion points, or mundus. =This skill is main support skill for many classes of healers. 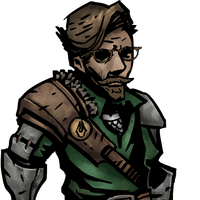 It gives a significant amount of resources allies along with addition resources from procing the undaunted skill line with the synergy. This is also heal over time that on casses out classes healing springs in range and effectiveness. In larger arenas, it will help keep spell power cure uptime. Not only this, gives ally a chance for a burst heal. Take note if you have no considerations for trials content then I would pick mystic orb over energy orb for more damage while still giving resources. (mutagen will be enough for smaller dungeons (aka 4 man) to keep uptime on spc)). So overall, it gives resources along with addition effects in support. - This is exceptional skill that all dungeon healers should use along with corresponding elemental blockade with shock glyph (84% just with these items) as concussed enemies will be set off balanced (10% more damage towards effected enemies as long as allies have the champion passive). Take note that concussion gives minor vulnerability (8% damage), so it works as well as other support set Infallible aether in most cases. 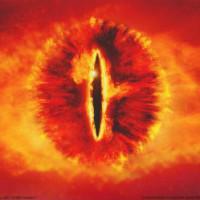 This effect lasts for 5 secs while off balances last for 5 secs though bosses are immune for 15 secs. Off balance is consumed via heavy attack on mobs that can be stunned (aka not boss monsters). Though reward off allies who use a fully charged heavy attack while enemy is off balanced is double resources back for the heavy attack. So overall it's a damage buff for allies, and resource tool. -Allows for extra resistances and aoe and aoe shock damage over time for procing concussion. Healer's gameplay is more about prediction, adapativing and reacting to the situation while making sure allies are supported and alive to do your bidding. Here below is a list of rotation of sort. You want to start making sure allies have Spell power cure buff with say mutagen, healing springs, or another heal while they are at max health. This easily done allies health is at 100% after battles, so by start of new battle they can receive this buff. While stamina dps are likely to have this already, but it's good to use set to apply minor on group. This can easily be done with orbs, conduit, or bone shield. While about to enter into fight or well dps (healer stands back to see playing field) , buff allies with standard combat prayer for minor berserk and resistances.. This is followed by Elemental blockade to produce off balance ( 10% damage buff ) . Though time there's a 15 sec cooldown on bosses and effect lasts for 4 secs. Followed by blockade of storm is a heavy attack from charged lighting staff with a shock glyph that is likely to give concussion for allies. This an 8% damage buff. The heavy attack also gives a chance for resources for allies and the caster, but also at this time is good to use orbs for dps to have resources for continued fight or to refill at end of fight. Dead dps is no good dps... and bad healer, so as fight continues add forms of protection such ring of preservation or shields. This could also be a moment to put down heal over time such as healing springs and blood altar. Before the fight, you want to buff allies with mutagen to give 20 sec long proc for spell power cure. When you first see enemies or know you about to see enemies, buff allies with combat prayer and set off bone surge. This will have combat ready. Just as fight as starting, you want to already drop liquid lighting for extra synergy and then use boundless storm to get in middle of fray and put down circle protection ( or put this near approaching mini bosses) . As dps start engagement of the fight, toss our 1 or 2 orbs, and then immediate use blockade of storms, following a bar swap to combat pray, then back again to back bar to do bone shield. Switch should heavy enough time for heavy attack to get sustain adds. Then follow up with another bone shield. If the fight extends for longer follow up with healing springs, then while healing springs ticking use this time to use blood altar and place another circle of protection. @troomar for numerous amour/food sets variations, along with fixing issue of sub par health with twilight. Also providing many insights in designs. @southrain for continued talk about what makes sorc healers great. Only place there's is some issues is vet Falkreath as lovely AI has it standing in ring of fire and no longer has major protection while standing in stupid. Don't happen always, but it really does happen. Otherwise it's highly unlikely to die. Somtimes it even holds arrgo while you rez everyone else who is dead. 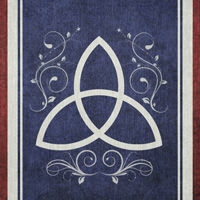 Aren't Templar the best or better healer? Better and best are such funny words it can all depend on the situation and group. But after heated debate, sorc can be proven to have skills to be most adaptive or say flexible healers . Numbers wise they will start off Superior before Warden and Templar passives obtain passives. Then it all depends on setup, procing of passives. Though mind you it's all close call between the three. At the time when I first made a sorc build, I hadn't had access to it. Then when I did have them it didn't seem to fit. Arena staves are all about giving resources to allies, and I think build does it innately.This also leaves room to attempt things that involve complete monster helms such as earthgore (negates) and sentinel (gives 4kish stamina ), or other support sets. 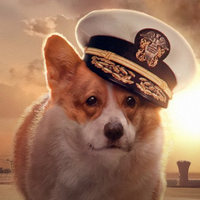 Can you compete End game content with this? Most definitely, especially when I was first started off with this build. I was often second guessing myself. After a while, though it did become instinct, and it was a lot of fun. Though, there's a few things though I did to make it better. As of Dragon Bones patch with outfit stations along with transmog of a sorts, I made overlord staff white, so it's easier to notice in dungeons. This avoided accidental usages of ultimate from other bar.. This was previously done via Enchantment color, but MOL weapons all shine with a blue glow after dragon bones. In the same regards, I made sure staff style was bigger then other bar's. The styles ended up using were order of hour on resto bar, and Ebonshadow with destro and overlord bar. (note: these styles look like a bat and bird respectively). Some other things to try is setting ultimate bar to a different key such one close to ultimate button or using a simple gaming mouse with one or two buttons on side. Tasear hasn't shared anything about themselves. * Note need to update superstar sheet to remove Expert Defender as it's PvP only skill. With the murkmire update this playstyle with overload is being removed as such will not be able to update it any longer.